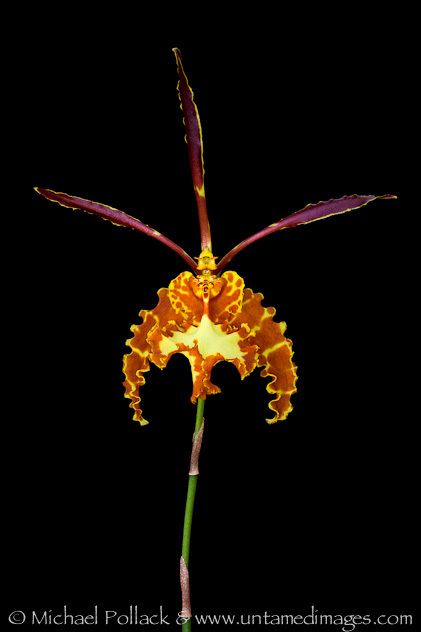 I photographed this Butterfly Orchid (Psychopsis papilio) in a makeshift indoor studio set up in my living room. Several months ago Alison and I were browsing in a shop specializing in orchids when we noticed one particular plant featuring a spectacular single flower. Unfortunately, the flower was past its prime and was showing some minor flaws that would be unacceptable in a photograph. The florist promised that the plant would generate additional flowers, so we bought the plant and since then I have been waiting anxiously for another flower to materialize, knowing a fresh flower would make a beautiful macro photograph. This type of orchid has a great deal of front-to-back depth which presented a challenge. I wanted to capture all the flower’s detail, but even using a very small aperture (such as f/22) would not provide sufficient depth-of-field to contain the entire flower. The solution to the problem was to take a series of images, varying the focus of the lens on each image, and then to combine the images in post-processing to preserve as much detail as possible. The photograph above is a composite of seven individual images, focused in regular increments from the “lip” in the front to the stalk in the back.